Sense of community--The biggest single advantage was that it created a feeling of community. --The system encouraged working together & sharing tools as most tasks took place at the same time. --In some villages, villagers owned a team of oxen and plowed each the strips in sequence. --Even the poorest villagers had the use of some land for crops or to graze cattle. They could also use the wasteland and the common. --It was cheaper to buy seeds as a community than individually. --It was cheaper to own a team of oxen as a village. 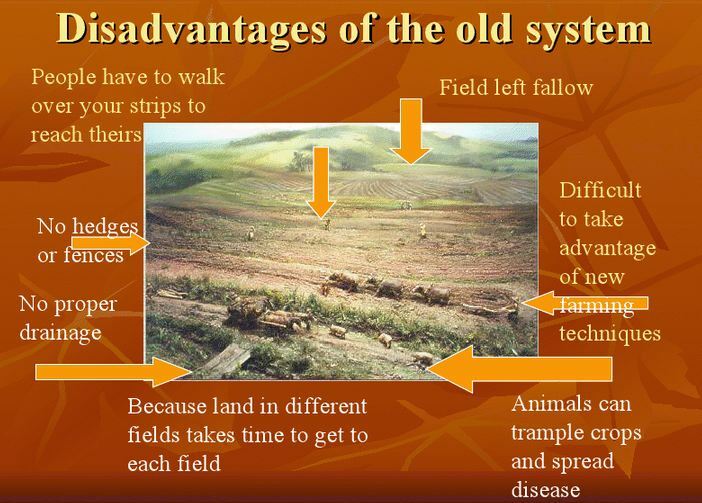 --The open field system had met the country's needs as far as food was concerned for many generations. --It provided security and support and a village structure where everyone had a clearly defined place. --Villagers enjoyed a sense of security. --Farmers had to walk miles between their strips. --Land was wasted on paths. --Neighbors could be lazy and ruin your crops. --The common land was wasted. --New machinery and ideas could not be used without a group decision. --The open field system did not allow any flexibility. --Each villager planted the same crops in the same fields at the same time as everyone else. --It was impossible to introduce new techniques. --The open fields were also very inefficient. --Population growth in the 18th century led to the development of towns, particularly in the north and Midlands. --Most of these people were unable to grow their own food and so depended on agriculture producing a surplus - which it did not.